Democratic presidential candidate Hillary Clinton is officially launching her personal private jet, even allowing reporters to ride with her on the trip to Cleveland, Ohio. 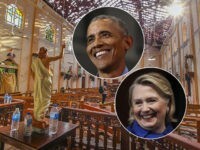 Several photos and details of the plane quickly dubbed “Hill Force One” were revealed by reporters as they waited to board the flight. The plane is a 14-year-old Boeing 737 that used to fly for Air Berlin, OrenAir and Corendon Dutch Airlines, according to CNN’s Dan Merica. The plane is separated into four cabins, one for Clinton, one for staff, one for the Secret Service and one for the press. The media have more than 40 seats in their cabin, allowing reporters to travel with Clinton. After reporters complained vigorously about Clinton’s refusal to have a press conference during her campaign, Clinton aides finally conceded to allowing reporters aboard the new campaign plane. “I hope this will shut you the hell up,” a Clinton aide said to Politico’s Glenn Thrush after making the campaign made arrangements for reporters to fly on the plane on Friday. 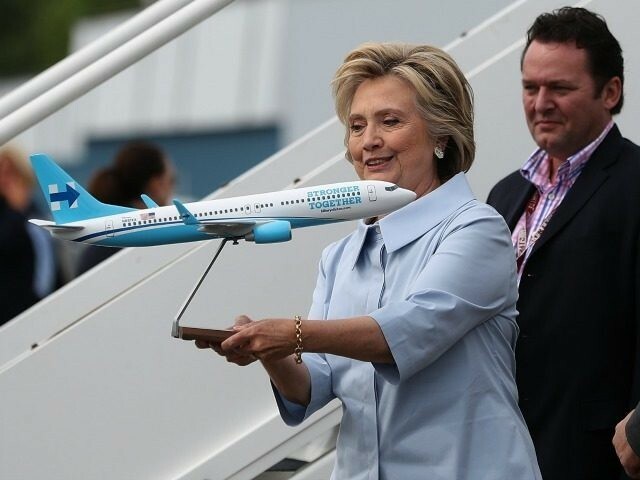 An airline executive presented Clinton with a small model of the plane as she prepared to board it for the first time.